Ну, как известно, Роджерс был продюсером Ноториуса (а так же исполнял некоторые гитарные партии в альбоме) и нескольких более ранних песен ДД. К тому же он периодически вспоминает о работе с ДД и если брать продюсеров, то Роджерс не менее близкий человек чем Ронсон. Так что решила открыть отдельную тему про него. What are you planning for this summer's Chic shows? We've changed our set a bit. We added a medley of Duran Duran's Wild Boys and INXS's Original Sin, both of which I produced back in the 80s. So it's going to be a hit-packed set? Always has been! By our second round of touring in 1979, we'd had five top 10 singles, plus the Sister Sledge stuff. We do some fun jazzy stuff, but it's hard to fit in because after all the stuff we love playing and the stuff people love hearing, we're 80 minutes deep. Can you recall Chic's first festival? It must have been different to the New York nightclubs you were used to. I remember it well. It was only our second show. The first Chic show was at a club called Casanova in Atlantic City, and the very next show was at Oakland Stadium, in front of 70,000 people. I had stage fright. That was the first time I ever drank a beer before a show. It was fantastic. I went on to drink quite a few beers! What we love is the interactivity. There is nothing like playing to a massive crowd when everyone is vibing on the same wavelength. I think Americans have lost the festival mentality a bit. As soon as a performer is over, or even before, we'll be running off to beat the traffic. Outside America, people still want to picnic, hang around outdoors. And that's me. I grew up a hippy. I lived outdoors. I was homeless for a while. I've always loved being with crowds, vibing. Man, that was amazing. Magical. People were crowdsurfing, which we don't normally see at Chic shows. I couldn't believe how many hot girls there were in Manchester. We did a couple of songs we thought would be semi-obscure, because the venue had this dark, underground vibe. So we played a song called Soup for One, and the audience were all singing it back. Incredible! Then Johnny Marr came out to play with us on Le Freak, and it brought the house down. You know he named his son after me? Nile Marr, he's also a guitarist. He told me that right before we went on stage, and I was on the floor. Are there any UK festivals you're particularly looking forward to? One that sticks out is Rock Ness. Loch Ness is a wonderfully fabled story here in America. And you're returning to Manchester for The Parklife Weekender – any chance you might play with Johnny? I would love that. Matter of fact, I spoke to Johnny the other day, because I want one of his guitars. Maybe he can bring it down to Parklife to jam with us. You know what? I'm going to give him a ring as soon as I've finished with you. Get ready for an evening of hits when CHIC play the Galway Arts Festival Big Top on Thursday, July 19th. 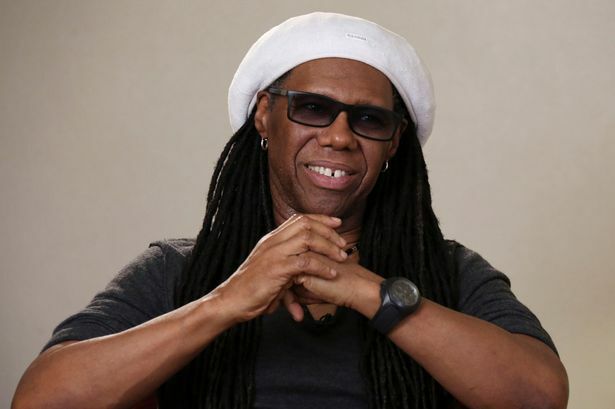 Band leader Nile Rodgers has been behind hits like Le Freak and Good Times, as well as David Bowie’s Let’s Dance, Diana Ross’s I’m Coming Out, Madonna’s Like A Virgin, and We Are Family by Sister Sledge. Punters at the Galway show would be advised to bring their dancing shoes. In his autobiography, Le Freak, which was published last year, Nile recalls his tempestuous childhood with a mother and stepfather who were drug-users. The television was often a baby-sitter, and Nile became fascinated with music-oriented programmes like The Lucille Ball Show. In 1970, at the age of 18, Nile met bassist Bernard Edwards. Seven years later they formed the band CHIC, whose songs would become iconic in the nascent disco movement. Yet Nile and Bernard had been working musicians for the guts of a decade, and neither had the swagger or desire to be a front man. “Well, we weren’t stars,” says Nile. “We had worked for stars, we were backup musicians. So that’s what we knew how to do. I’m certainly not putting anybody down, because I work with stars all the time – but stars are stars because they think they’re stars. They know it, they feel it. And compete they did. When you hear Le Freak’s opening lyrics, ‘aw freak out, le freak, c’est chic’, you know it’s time to start moving. CHIC also penned gems like Good Times and Everybody Dance. Nile and Bernard found themselves in demand, working on Diana Ross’s hit album, Diana. Nile also went on to collaborate with Bowie, Mick Jagger and Duran Duran. In 1996, Bernard and Nile went to Japan to perform at a concert celebrating their work. Three sold-out nights in Tokyo saw them joined by collaborators like Slash, Simon Le Bon and Sister Sledge. Tragically, it was to be Bernard Edwards’s last concert – after the final show, he died from pneumonia in his hotel room. Nile recalls the events of that night. “It was a packed house; we were playing at the Budokan,” he says. “And before we walked out on stage, he looked from behind the curtain and he says – these are his exact words – ‘wow, we did it. The music is bigger than we are’. The music Bernard and Nile made obviously looms large in Rodgers’s acclaimed autobiography, which is a real story of ups and downs. As a child, he witnessed drug addiction first hand, but he also writes about his mother and stepfather with great affection. There’s no bitterness, and he’s keen to praise them as essentially good people. Disco pioneer Nile Rodgers, 59, ruled New York night life during his band Chic’s chart-topping heyday in the late ’70s. As he recounted in his 2011 memoir, “Le Freak: An Upside Down Story of Family, Disco, and Destiny,” New York in the 1970s was an anything-goes world. Rodgers, who makes a guest appearance on Adam Lambert’s new song “Shady,” happily followed that world as far as it would take him. This is his disco-era New York. It's quite likely that if you are of the younger generation you will not have heard the name Nile Rodgers. You will though most certainly have heard at least one of his songs. Nile Rodgers: The Hitmaker is currently on BBC iplayer for those who can receive it. If there is one word that defines the man as an artist, it is eclectic. If there is one that defines him as a human being, it is survivor. In December 2011, he described in graphic detail to a BBC audience how he died eight times, going seven better than Nicki Sixx. In this hour long BBC documentary, native New Yorker Nile explains how he grew up around music - mostly jazz - but moved (via Sesame Street) into disco - a sound he helped define with songwriting partner Bernard Edwards and their creation Chic through Sister Sledge - then went on to work as an A League producer with rock musicians from Bryan Ferry, a major influence; to Duran Duran; guitar virtuoso Jeff Beck; and helping make Madonna one of the biggest female stars on the planet. For that alone we can forgive the part he played in inspiring hip hop. Although he has a unique guitar style, there are no rock-style solos in his work, but by and large this is uptempo commercial music with a feelgood aura about it. Whether you call him disco, middle of the road or rock producer, he lived the lifestyle that has killed many less fortunate fellow travellers, but it was not hard living that killed Bernard Edwards. It's difficulty to believe he will have been gone seventeen years next month. In April 1996, he and Nile were playing in Japan when he was taken ill. The doctor told him he had to go to hospital immediately, but Bernard said the show had to go on. And it killed him. Nile recalls the last words his partner spoke to him over the phone from his hotel room. "I'll just need to rest". It was Nile who found his body; he had died from pneumonia aged only 43. Fortunately for both himself and music, Nile put the drugs behind him; like especially Keith Richards, he is living proof that longevity is 90% genetic, so hopefully he will be making music for many years to come, as both a producer and in his own right. Whatever he may be doing in the studio, Nile will be in the UK for the Mostly Jazz, Funk And Soul Festival at Birmingham later this year. Up all night with Nile Rodgers and Chic in Kuala Lumpur. THE funk keeps you young. And it takes you around the world. That seems to be the case with Nile Rodgers, 61, who has found himself a new fanbase with his collaboration with Daft Punk earlier this year. Rodgers, who is the founding member of the band Chic, was part of Daft Punk’s chart-topping album Random Access Memories, featuring the hit single Get Lucky which he co-wrote and plays guitar on. Alongside his legendary group Chic, the man is also on an extensive international tour with his catalogue of chart-toppers from the classic 1977-82 period. Rodgers will bring the party – disco balls and all – to KL Live in Kuala Lumpur on Dec 4. In a career spanning five decades, Rodgers has crafted some of Chic’s best disco classics (Le Freak, Good Times, Everybody Dance, Soup For One) and also produced songs for some of the biggest names in music (David Bowie, Duran Duran, Debbie Harry, Diana Ross, Sister Sledge, Madonna, INXS, Mick Jagger, Peter Gabriel, Britney Spears). Over 30 years later, Chic and Rodger’s music still sounds relevant and it transcends the disco era. Disco king Nile Rodgers is strutting into Birmingham on Wednesday, March 25 for a gig at the 02 Academy. The guitarist, who has earned a reputation as a producer, working with the likes of Madonna, Mick Jagger and Jeff Beck, has been busy working on an album with Duran Duran, which he says is due out this autumn. Nile is also excited about releasing a new Chic album in June, which will see him reunited with bass player Bernard Edwards, who died 20 years ago of pneumonia after a gig in Tokyo. Labelled as being “written and produced by Bernard Edwards and Nile Rodgers’’ it is being released following the discovery of some lost master tapes. Bernard and Nile made their names in the late 70s as Chic released dance floor favourites Le Freak, Good Times, Everybody Dance and I Want Your Love. The New Yorkers then wrote and produced disco anthems for both Sister Sledge (We Are Family, Lost In Music) and Diana Ross (Upside Down, I’m Coming Out). Nile cemented his reputation as a producer with David Bowie’s biggest selling album, Let’s Dance, before sending Madonna’s career stratospheric with her second long player Like A Virgin. Nile and Bernard reunited Chic in 1992 to record their first album in nine years and tour the world, before tragedy brought their extremely fruitful partnership to an untimely end. The next decade saw Nile concentrate on film and video game soundtracks but that all changed in 2010 when a mysterious package arrived from his old record company Warner Brothers. ‘‘They realised they had a huge amount of Chic tapes and returned them to me,’’ explains Nile. ‘‘I started listening to them every day, listening to the band talking, laughing and working together. ‘‘It felt like going back in time. ‘‘Everything was perfectly preserved. We were just jamming but the grooves were so far ahead of their time in a certain way that I started to toy around with the idea of finishing some of these songs. Nile was diagnosed with an aggressive form of prostate cancer and as it dawned on him his days may be numbered he decided to play more concerts than he’d ever done before. ‘‘I figured that while the doctors were doing what they were doing, which was quite hideous, I would balance that out and do the things that make me feel the best – writing and playing music." Nile has been cancer free for some time but admits he still dreads his twice-yearly check-ups. Late last year, Nile, aged 62, returned to his box of lost tapes. ‘‘I wanted to wait until I felt relatively strong, until I felt I could go out on stage and represent this new music properly, and I started thinking about the whole artistic approach to the record. ‘‘When the album comes out in June, Bernard will have been dead for nearly 20 years and there’s a very famous character in American literature, Rip Van Winkle, who falls asleep for 20 years. ‘‘And so I treat the album – lyrically, spiritually and artistically – as if Bernard has come back from the dead or as if Bernard has woken up after 20 years like Rip Van Winkle did. Fans at the Birmingham gig will have to wait until June to hear the lost tapes because the setlist for Nile’s gig at the 02 Academy will be very hit heavy. Nile explains: ‘‘Most gigs, I ask the crowd if it’s the first time they’ve seen us. Almost every time, 60 to 70 per cent raise their hands. So it would be unfair to play too many songs they don’t know." Over the years, Nile has worked with Debbie Harry, Michael Jackson, Bob Dylan, Peter Gabriel, INXS, Carly Simon, Johnny Mathis, Grace Jones, Robert Plant... the list goes on. His prized 1959 Fender Stratocaster has featured on records totalling £1.5 billion in sales. No wonder he calls it The Hitmaker. More recently, Nile has teamed up with Avicii, Disclosure and Sam Smith, while one track on It’s About Time is said to feature the combined talents of Elton John, Miley Cyrus, Chaka Khan and Janelle Monae. But of all the legendary acts Nile has worked with, there’s one with whom he feels there is some unfinished business. ‘‘I’m tying to work with Bowie again at least once, live,’’ he says, rather ambitiously considering the so-called chameleon of rock hasn’t set foot on a stage in nine years. ‘‘We include Let’s Dance in our set and it’s so cool. I think that even if Bowie comes out and we only do two or three songs together it would kill. The full scope of Niles’ career is difficult to comprehend and it’s not just ongoing, it’s in overdrive. This is most definitely Chic’s time. Nile Rodgers got an up-close-and-personal view of the real workings of Riverhead Tuesday night, when he headed to the emergency room of Peconic Bay Medical Center after injuring his leg during the first night of the FOLD festival at Martha Clara. In a rare moment when Rodgers was found sitting during the two-day festival — he’s a man in constant motion, with joyful energy emanating in every move — the music legend explained that he suffered a minor injury at the previous night’s performance, when he wowed the crowd with non-stop dancing, jumping and a masterful guitar performance with Keith Urban that had fans screaming. But his experience at PBMC couldn’t have been more pleasant, he said, with locals giving him a warm welcome. The ER nurse, he said, had attended the first night of the FOLD festival. It’s the warmth he’s found locally that sparked a dream Rodgers has of possibly planting permanent roots in the area. Local officials have welcomed Rodgers with open arms. On Tuesday night, Riverhead Town Supervisor Sean Walter said he’d love to have the music legend buy the Martha Clara property. Rodgers said the idea has crossed his mind, and he’s even inquired, but found the asking price a little steep. Last year, Newsday reported that the Martha Clara property, including 200 acres and the vineyard, was on the market for $25 million. Sitting in his dressing room last night before the second half of the festival, Rodgers reflected on how it felt to see his dream realized, with a series of seemingly disparate musical sensations coming together on his stage for once-in-a-lifetime moments. Looking out at the audience of thousands touched him deeply. “I’m ecstatic,” he said. “Last night was a night I’ll never forget, so magical and special,” Rodgers said. The idea for the festival was born in Europe, where festivals bring people together for days, all sharing the same passion. “I believe in the music,” he said. In many other places, “they don’t have the same politics” but legions of fans have come to love Rodgers, listening to his songs on the radio and sharing his music over generations. Having Beck onstage was particularly meaningful, Rodgers said; Beck made history when he took the stage at the Coachella Valley Music & Arts Festival, an annual event featuring a wide range of music including hip hop, rock, indie, and electronic dance music. And now, Rodgers said, Beck was a part of history again, as part of Rodgers’ first annual FOLD festival. It’s his ability to mesh the diverse talents of so many vibrant and emerging artists that keeps Rodgers at the cutting edge and always current; Duran’s new single, “Pressure Off,” which also features Janelle Monae, is a fusion of electronic dance music and each artists’ unique sound and was produced by Rodgers. Along with his disco hits, many don’t realize that Rodgers, a songwriter, producer and founder of Chic, the legendary dance band behind megahits including “Le Freak” and “Good Times,” has collaborated with stars in a such wide range of musical genres, including Madonna, David Bowie, Duran Duran, and more recently Daft Punk, with whom he picked up three Grammy Awards in 2014, Pharrell Williams, Aviici and Disclosure. “And now country,” he said; he and Urban are collaborating on an album. Rogers said that ten-minute guitar jam with Urban had everyone talking. “We were ripping — definitely shredding,” he said. The festival also featured names such as DJ Thomas Gold, who like Avicii at Rodgers’ last Riverhead show, had the younger generation screaming. The festivals, he said, bring together generations; his goal was that no matter what time someone arrived, they’d always hear a hit song, Rodgers said. Pharrell Williams, whose red-hot hit “Happy” had thousands singing along, tearfully thanked Rodgers Tuesday and said it was an honor to share the stage with him, making a promise to be there for him, always. Despite soaring careers, Rodgers said it’s the friendships he shares with fellow artists that fueled their desire to be part of the festival, some flying for thousands of miles to sing three songs onstage. Performing together, he said, there were “no egos,” just the shared fervor for the music that fueled the winning collaboration. Laughing, Rodgers admitted that maybe he’d been too ambitious, booking such a lengthy lineup of acts, and said he’ll try to hold back a bit in the next go-round. But judging by the screams of the crowd, the spectacular lineup, which last night included Chaka Khan, Duran-Duran and many more, his winning formula pleased. Nurturing young talents who emerge as break-out stars gives Rodgers deep satisfaction. “It’s just how I learned,” he said. After his first professional gigs, as a member of the “Sesame Street” road show and a band member at Harlem’s Apollo Theater, Rodgers said he performed jazz and classical and was mentored by many along the way as his career took shape. Keyboardist Richard Hilton, who’s been with Chic for over two decades, said simply, “These have been the best 27 years of my life.” A Bethpage resident, Hilton credits Rodgers for infusing his life with security; a steady income 52 weeks a year, even during the months when they’re not touring — a rare gift in the music business. “He’ been a blessing to me and my family,” Hilton said. Chic member Kim Davis, whose unstoppable vocals astounded the crowd both nights, said she grew up listening to Rodgers’ hits and auditioning for the legend was the moment of a lifetime. “I sang, ‘I Want Your Love,’” she said. And now, Davis said she’s honored to share the journey, “helping him to live his dreams.” After surviving cancer, Davis said sharing his life’s music is even more important to Rodgers. “All he wants is for us is to sing these songs, and sing them with meaning,” she said. Offstage, Chic and Rodgers are close, laughing and enjoying each other’s company even at the airport after being up for hours. “We are family,” she said simply.